14344 | What Does 14344 Mean? 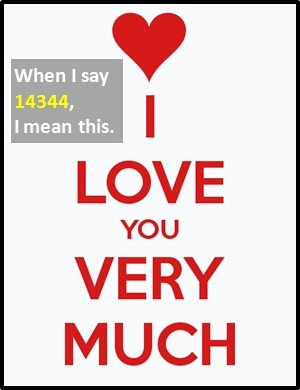 14344 means "I Love You Very Much" (number of letters in each word). 14344 is formed by using the number of letters in each word (I (1) Love (4) You (3) Very (4) Much (4)). I Love You Very Much is also often abbreviated as ILYVM. 14344 adds emphasis to a declaration of love. Person B: If you really loved me, you would just say it. Person A: You are so special to me. 14344. Person B: What have you done wrong now?. 14344 is classified as a cyber term as opposed to an�initialism abbreviation�or an acronym. Initially, cyber terms were introduced for brevity, but, particularly with the advent of predictive texting and on-screen keyboards, they are now mostly employed for fun. Before the digital era, we would have said something like "I Love You Very Much" instead of using 14344.